Many of you may know that I spend a great deal of my holiday time on a sunny beach on Thormanby Island near Sechelt on the Sunshine Coast of B.C. It is one of my favourite places on earth - for its remoteness and untouched natural beauty. The mainland communities (Secret Cove, Halfmoon Bay, Sechelt and Pender Harbour) can only be reached from Vancouver by BC Ferry. The remote nature of the communities means that employment is limited. And I was glad to see so many new jobs created by the many large construction projects by Wakefield Construction. 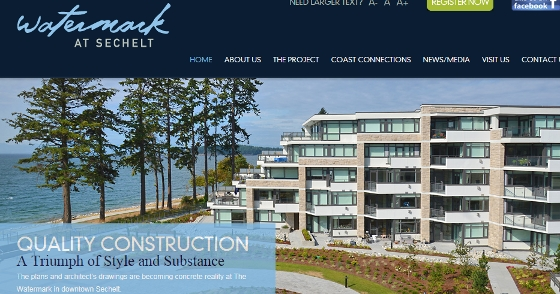 Particularly the new and upscale Watermark condos on the Sechelt waterfront. Kim Darwin, president of the Sechelt and District Chamber of Commerce, said Wakefield’s closure, “will be a great loss to the community.” “The impact will surely be felt through the trickledown effect to sub-contractors, construction supply outlets and other local businesses. We sincerely hope that our other local construction companies will be in a position to fill some of the void that will be left as Wakefield exits the local construction scene,” Darwin said.